Asbestos continues to pose a significant health hazard to tradespeople and with an average of 20 tradespeople dying from asbestos related diseases every week, awareness of how to work safely with the material is as important as ever! 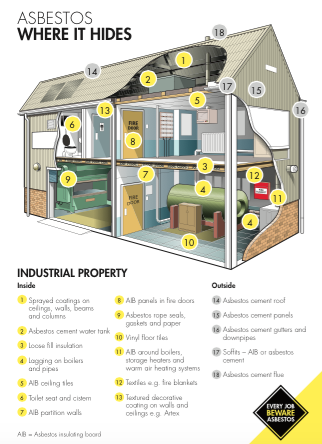 Asbestos can be found inside and outside a property built before 2000. It is particularly dangerous as you may not know that you have even come into contact with it. Most commonly it can be found in garage roofs and floor or ceiling tiles. If undamaged asbestos is not classed as dangerous but once the material is disturbed tiny asbestos fibres are released, which can prove lethal if breathed in. This means completing even small jobs, for example, drilling a hole, can be potentially hazardous. Along with The Health and Safety Executive (HSE) we strongly advise that whether you are working on a home or a commercial property that each tradesperson should do an asbestos risk assessment prior to each job. At Magnet Trade, we are in full support and keen to promote a brand new free web app from HSE, which looks to provide tradespeople with tips on how to work as safely as possible with asbestos.